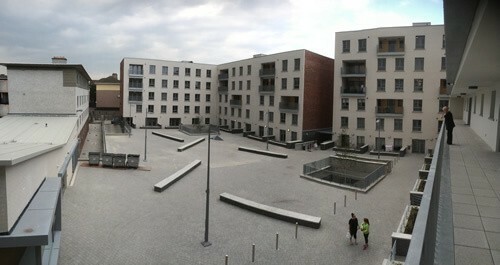 Liberty House Apartment Development – Duggan Brothers Ltd. Phase 1 consisted of the diversion of the mains water service for all buildings in the local area; the relocation of local area pump-house; diversion / relocation of mains gas, ESB, telecommunications and drainage. Phase 2 involved the construction of 2 no. apartment buildings containing 56 no. residential units, the construction of a basement car park, a community facilities building, plant and services and associated site and landscaping works. This new apartment complex consists of 16 no. one bedroom residential units 34 no. 2 bedroom units, 6 no. 3 bedroom units, a basement car park for 27cars and a community facilities building. The apartment buildings are generally 5 stories high with the South Eastern corner at 6 stories high. 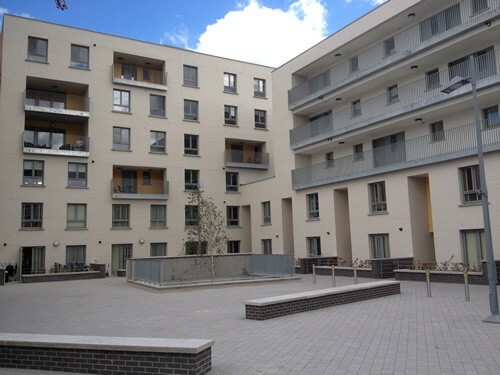 Ground floor duplex housing units are entered directly from the street or from the enclosed landscaped courtyard, upper floor apartments are accessed via staircase/lift lobbies and some via shared access decks. Construction consisted of alu-clad windows and doors; brick and render facades; insitu concrete walls with precast concrete floors and stairs; on insitu concrete basement walls and floors; on 600mm diameter piles to bedrock 16m below ground. All apartments were furnished with fitted kitchens and wardrobes, gas boiler heating system, timber flooring throughout, large timber decking area to each private balcony. Phase 3 involved the demolition of the 4 storey existing residential flat complex - blocks E and F at Liberty House, Railway Street, and for the construction of fencing around this area, finished with tarmac with markings for various sporting activities. 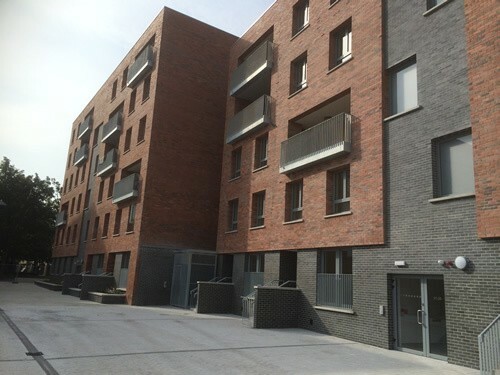 The development was carried out in two phases over a 20 month programme 4 months ahead of schedule in a tight city centre site surrounded on all sides by residential and commercial premises.